The ICJ Referendum is only 26 days away - but today the PUP asked the Supreme Court to stop the government from going ahead with the referendum. 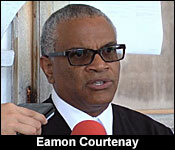 Eamon Courtenay's law firm filed the claim last week Wednesday, and Chief Justice Kenneth Benjamin heard their application today. It is built on the legal opinion of attorneys: Anthony Sylvestre, Richard "Dickie" Bradley, and Kareem Musa. 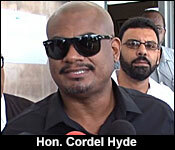 They argue that the 2008 Special Agreement is not in conformity with Belize's constitution. They say that the Government signed this agreement transferring authority to the ICJ to change Belize's borders, if they should decide that Guatemala is entitled to any of Belize's territory. The argument is that Government should have taken this to the House of Representatives and the Senate, since changing Belize's borders means amending the Belize constitution. PUP area reps Michael Espat, Oscar Reque&Atilde;±a, Rodwell Ferguson, Julius Espat and Cordel Hyde, are named as the claimants in the legal challenge. Chief Justice Kenneth Benjamin heard their pivotal application today where Attorneys for both sides argued over how best to address this claim, given that was brought so late. "The hearing was set for the urgent interim injunction that the claimants are asking for. Essentially, they were asking for 2 two things, for the Prime Minister to be prevented from asking the GG to hold writs of referendum. In fact, that has already happened. That request was made back in January, and the writs were issued in February. So, this is well after any such requests. So, what I signaled to the court is that Mr. Courtenay accepts that that has already happened. So, what we will be arguing over, in terms of injunction only, will be the matter of whether the matter can and should be conducted." "Is there a real prospect of success from these claimants? We're only 20 days away from the referendum." "You know I'm going to say no to that, however, that will be left up to the court. The Chief Justice has already said that the substantive matter will not be heard now. But, he had a date for first hearing for April 1st, which is now vacated in order to make this interim injunction hearing a priority. So, that's already one big push back to what is going to happen. There is a train, which is already going, already on the tracks, already full steam, and moving toward April the 10th. So, there is a balance of fairness that the court must look at." "Among the issues of the balance of convenience that the Chief Justice will be the issue of what would be the greater injustice, to hold the referendum, or at this stage, to stop the referendum. So, that's one of the things that he will look at. It has taken years to get to this point, specifically, over a decade, because the Special Agreement as you know was 2008. The protocol to change that is 2015, and of course the entire issue of Senate ratification was in 2016. And then, the announcement was 2 years after that, which was last year 11 months and change ago, and here we are at the 11th hour, the claimants now bringing this claim, and the Chief Justice was very right to point out and say, "How unno di come so late?" "Is all of that time, money and investment at risk with this particular claim, and we will put in affidavits to that effect." "We consider this matter to be very serious, and we're very pleased that the Chief Justice has agreed to hear this case. We know that the other side has tried to make a point about us bringing this matter late, but I want to emphasize that after we got the opinion from learned attorney Anthony Sylvestre, we had our other attorneys look very closely at it very quickly, and we moved expeditiously to file this matter in court." "Under the laws of Belize, the people of Belize have the final say - have veto over any proposed final settlement with Guatemala. In other words, we get to say ye or nay on any proposed settlement with Guatemala. What you have under the Special Agreement is a proposal to outsource that power to 15 foreign judges. In other words, we would be saying to 15 foreign judges, you decide this matter. You settle this matter, and we will live with it. We will have to live with it because under the terms of the Special Agreement, essentially what we're doing is we're saying its binding. Anything from the ICJ would be binding, would be final. If we go and lose, we would be crying, weeping, gnashing of teeth, but we cannot do anything about it. And what we are saying is that that's a very far-reaching consequence of the Special Agreement, and the Foreign Minister does not have the authority to bind the people of Belize without getting an input from the people of Belize, through their parliamentarians in the National Assembly. We never got that. So, understand this, if we go to the ICJ under this Special Agreement, our borders - what we knew as Belize - can be altered.If we got to the ICJ under this Special Agreement, the people who live down south may not be Belizeans when all is said and done. At least where they live may not be part of Belize anymore." "We believe that there are compelling reasons for this matter to be before the court, and that's why I stressed to the Chief Justice that the Government itself is saying that this is a matter of national importance. If both sides agree that this is a matter of national importance, it seems that the Government could easily give an undertaking that they will put off the referendum, until the Supreme Court has determined this matter. Let us not forget that Guatemala postponed their referendum twice. There is no magic to the 10th of April. And so, I believe that the rule of law must prevail, and this matter should be completed before the referendum is held." "Are you concerned that the international community may take interpretation that Belize is flip-flopping on whether or not it wants to hold this referendum, as we've accused the other side, Guatemala, of doing?" "You know, my brother, in our dealings with the international community, I think we've sacrificed some of our sovereignty. So, we are at this point where it seems like we have to take instructions from the international community. But, that happens when you go hat in hand to the international community begging for money all the time. You know that we have literally gone to the international community to beg for money for our education campaign on the most critical, the most existential question of our lifetimes. The Government could not find 8 million dollars or 5 million dollars, is required to have an education campaign that will be fair, that will be balanced, where the pros and the cons will be delivered, full of facts, full of history, free of fear-mongering. We can't have that because we are around the world begging for money to provide this education campaign to our people. If you take these people's money, then these people will give instructions to you." "Observers look on and say, why is Ms. Lisa Shoman who has made her identity and professional career as a PUP siding with-"
"Hold on, hold, I am still PUP! I am still a PUP and until I am excommunicated, I will continue to be PUP. I think even the deputy party leader and the Party leader would agree. So, let's get that out of the way. You know, this is not PUP. It's not about UDP. It' about Belize. And let me just remind everybody. It is the People's United Party that started this journey, that knew that we were going to go to the ICJ. In fact, I was the foreign minister when Jose Miguel Insulza recommended that we should go to the ICJ. The government thereafter change, and Senator Courtenay was present when the Special Agreement was signed. So, we've known this day coming now for over a decade." 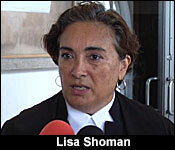 "The responsibility to deal with the case demands that there be strong and forceful argument on both side. I can't think of a better person than Eamon Courtenay to on behalf of the Opposition. And quite Frankly, I find myself honored to be arguing the case with him because I think whatever the decision is, the one who will win is the people of Belize." The Chief Justice has scheduled the hearing for the injunction application for April 1st. He told the parties that he wants to have a decision on it several days before the scheduled referendum.